This kit is ideal for intermediate cheese makers and makes up to 7kg (15lbs) of specialty cheeses. All consumables can be purchased seperately once used. 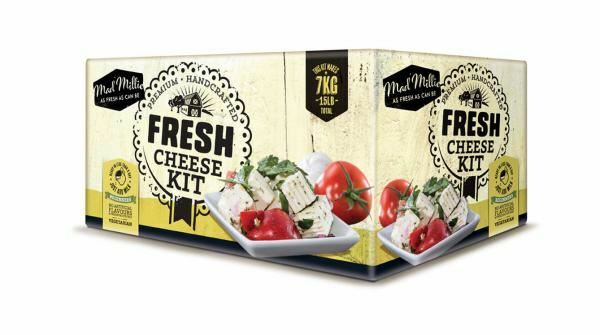 For best results, use this kit with the Mad Millie Cheesemaker. Kit Contains: Cheese cloth, Cheese Moulds (2), Silver and White Cheese Wrap 240mm x 240 mm (20 Sheets), Artisan's Cheese Salt, Steriliser, Pencillium Camemberti Culture (3), Pencillium Roqueforti Culture (3), Aromatic Mesophilic Culture (6), Vegetarian Rennet Tablets (10), Maturing Box, Thermometer, Calcium Chloride, Pipette, Kit Instructions and Recipe Booklet.